Despite these efforts, landmines continue to be placed, adding onto the many remaining from the millions that have been planted since 1900. They cause great harm by denying civilians access to their homes and land, as well as by causing bodily harm, death, and psychological duress. 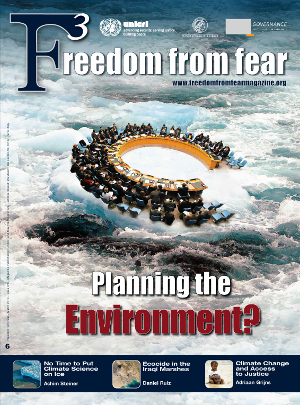 According to a recent report,(1) people in more than 70 countries are adversely affected by mined areas, and nearly 500,000 people live with injuries inflicted by mines. Many victims are both severely handicapped and unable to afford the rehabilitation and the other services that they need. Demining hazardous areas is hugely important and is currently accomplished through the use of mechanical devices, such as hand-held metal detectors, and with the help of animals, such as specially trained dogs. APOPO has recently begun using giant African pouched rats (Cricetomys gambianus) as mine detectors. The rats are nocturnal burrowing natives of sub-Saharan Africa. They are pests in the wild and are sometimes hunted and eaten. They can live up to eight years; the adults reach body lengths of 25-45 cm and they weigh 1-2 kg, making them considerably lighter than dogs, and it is therefore substantially more unlikely for them to detonate the mines with their weight. APOPO’s rats are born and trained in Morogoro, Tanzania. Pups are handled regularly to socialize them; they are then trained to sniff the ground and to pause when they smell 2,4,6-trinitrotoluene (TNT), which is the main explosive charge in most mines. The training takes about 250 days (three times less than the time required to train mine detection dogs); it starts in a laboratory, where the rats learn in long metal cages to stop at holes above TNT. They then learn to locate perforated balls containing TNT that are buried in sandy soil. The final stages of training occur on a large simulated minefield. All throughout the training and the detection process, the rats’ correct behaviour is reinforced through positive operant conditioning, with rewarding treats like smashed banana bits. 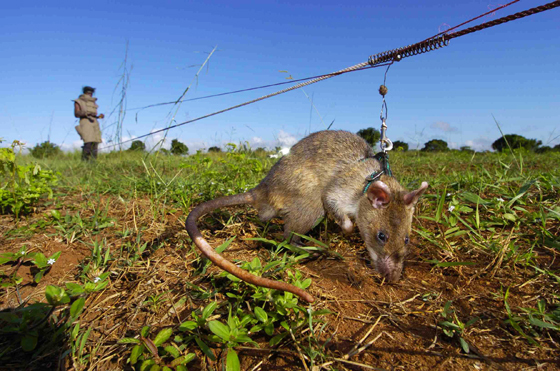 When working on the minefield, the rat wears a harness attached by a lead to a rope stretched between two handlers, who walk in parallel about 10 meters apart. The rat moves back and forth along the rope as the handlers move slowly forward. This technique allows the animal to sniff all of the ground between the handlers. Indicator responses, defined as pausing and scratching at the ground for 5 consecutive seconds, are recorded, along with the number of mines correctly located and the number of false alarms, which are indicator responses emitted more than one meter from a mine. Once a rat performs well in training, it is exposed to a test in which it must find all of the mines in a 100 square meter area with no more than two false alarms. APOPO is currently engaged in demining operations in Mozambique’s Gaza province, where many mines remain from the 16-year long civil war that ended in 1992. A team of 50 APOPO personnel and 34 rats, outfitted with a variety of equipment, do the work. Once the rats arrive at the demining site, their training continues on a simulated minefield. When a rat’s performance stabilizes, an accreditation test is performed with the help of the National Mine Action Authority. To pass, a rat must detect every mine in a 400 square meter field containing 5-7 mines with two or fewer false alarms. If it passes – and nearly all rats sent from Tanzania do so on their first try – it is licensed by the Mine Action Authority as an operational mine detection animal. In field operations an armoured bush cutter first removes the vegetation. Humans wearing protective gear and equipped with metal detectors (manual deminers) then clear safe lanes which they conspicuously mark. In most operations, the rats are worked on a rope stretched between two trainers wearing protective equipment who move along the safe lanes as the rat searches along the rope, as previously described. Two different rats examine every area. Locations where an indicator response occurs are checked by manual deminers who then dispose of all mines and explosive remnants of war (e.g., grenades, mortar rounds). In 2009 APOPO’s demining team cleared nearly 310,000 square meters of land, finding 182 landmines and 248 explosive remnants of war, and allowing more than 1,000 families to return to their homes. Although most people view rats as “bad animals” that carry diseases and destroy property, we call them “HeroRATs” for the valuable humanitarian service they perform. The project in Mozambique shows that Cricetomys are useful mine detection animals with valuable characteristics. For instance, they are resistant to tropical diseases, easy to maintain, and too light to activate mines they step on. APOPO was founded by Bart Weetjens a decade ago as a tiny social enterprise. Early-on, most of the work was done by Bart, his colleague Christophe Cox, their wives, and one to three trainers. APOPO now employs 140 people (the vast majority are citizens of Tanzania or Mozambique), and it was recently given NGO status by the Belgian government. It is noteworthy that APOPO uses Cricetomys for beneficent purposes, treating them humanely, emphasizing sustainability, working in an impoverished area of Africa, and using local employees whenever possible. Put simply, APOPO does its best to make the world a better place, even if it does so one rat at a time. (2) Weetjens et al. 2009. “African giant rats for tuberculosis detection: A novel diagnostic technology.” In Global Forum Update for Health Volume 6 (pp. 39-42). Woodbrdge, UK: Pro-Book.